#264 – Birthday! Robots! And Our First Shirt! #265 – Ding Dong! The Witch is Dead! 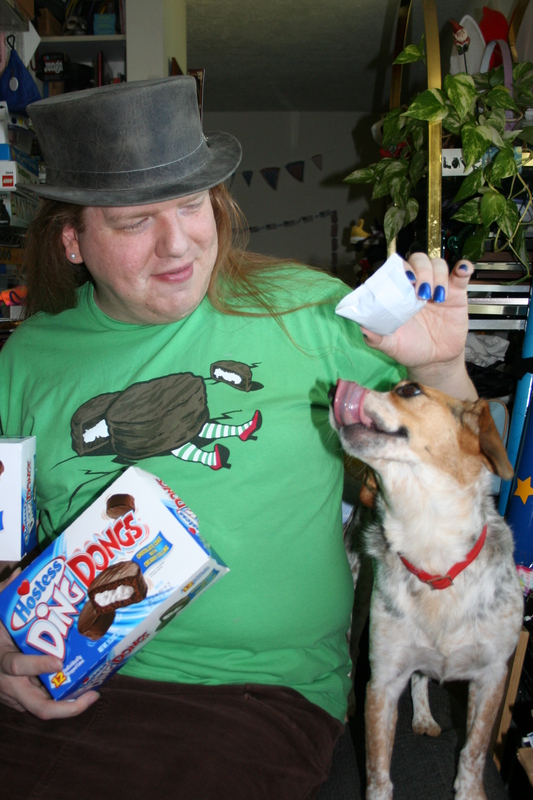 But dogs do LOVE the creamy fFrosting!!! Skotte is quite sad those delicious Creamy delights are no longer available. Then again, the shirt is not available either. Bother. And now you may ask yourself: have we been saving this box of pastry, hoarding it like obsessive weirdos? Or have we been saving this picture, lazily getting around to posting it months later? Which of these options would make you respect us less? You may hear chocolate is bad fFor dogs, which is true (if sometimes exaggerated). Maddie got into a whole big bunch of chocolate covered goodies, a fFew days after Christmas. She was actually pretty sick fFor a day or two. Not life-threateningly sick, but really not a happy puppy at all. A real bummer. We do like how happy a little lick of fFrosting can make her, though.